KATHMANDU, July 25: The 15th Bay of Bengal Initiatives for Multi-Sectoral Technical and Economic Cooperation (BIMSTEC) Ministerial Meeting is scheduled to be held in Kathmandu on August 10-11. According to sources at the Ministry of Foreign Affairs (MoFA), the date for the ministerial meeting has been finalized after communication with all BIMSTEC member states. Senior officials' meeting (SOM), which is represented by foreign secretaries of the member states, will precede the ministerial meeting on August 11. Indian External Affairs Minister Sushma Swaraj, Sri Lankan Foreign Minister Ravi Karunanayake, Bangladeshi Foreign Minister Abul Hassan Mahmood Ali and Bhutanese Foreign Minister Damcho Dorji are scheduled to land in Kathmandu on August 10. "Thailand and Myanmar have communicated that they would send deputy foreign ministers in the meeting,” said a source at the MoFA. The ministerial meeting holds significance as this will set the date for holding fourth BIMSTEC Summit. In the capacity of the current chair of the sub-regional body, Nepal had proposed to host the fourth BIMSTEC Summit in Kathmandu in October or November during the 17th session of BIMSTEC SOM. Nepal had originally proposed to host the ministerial meeting in June. However, the meeting could not take place due to lack of availability of convenient time for ministers from various BIMSTEC member states. BIMSTEC has set various 14 priority sectors for cooperation including trade and investment, transport and communications, energy, tourism, agriculture, counter-terrorism, poverty alleviation, public health, environment and natural disaster and climate change. The ministerial meeting is expected to finalize various key agreements on priority areas including the establishment of the BIMSTEC Grid Interconnection. The 17th SOM in Kathmandu earlier this year had taken various important decisions to revitalize BIMSTEC process as outlined in the Outcome Document of the BIMSTEC Leaders' Retreat held in Goa, India in 2016, and its 16-point Agenda of Action. 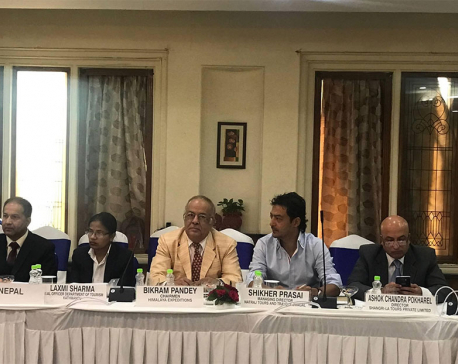 The SOM had tasked the Eminent Persons Groups (EPG) to work out the BIMSTEC vision-- a roadmap for the Future Directions of BIMSTEC in line with the UN Agenda 2030. Officials said the upcoming SOM and ministerial meeting will review the progress made so far on the decisions taken so far on BIMSTEC process and find ways to resolve the problems, if any, seen in the implementation of BIMSTEC's ongoing projects. "Most importantly, the meeting will decide on ways to revitalize and give dynamism to BIMSTEC in the changed context and priorities of member state," said officials.